Do you know your target? How close are you to getting it? 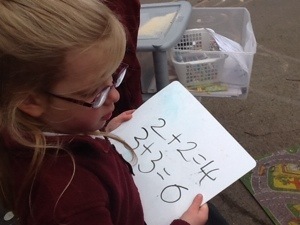 We have been learning how to estimate. We now know that an estimate is a sensible guess. Can you estimate how many pieces of treasure there are here? We had a good look through the telescope. What do you think we saw? Today it was really windy. Miss Lomas read us ‘The windy day’ and then we had a go at making our own kites in child initiated learning. We had to run fast to make our kites fly. We have had lots of fun raising money for Sport Relief today. We have had penalty shoot outs in football and basket ball. We achieved 31 shots between us in Class 2.